The morning sun shone on four Olympians as they made their way through the country side of Greece. One of them, a boy named Hades, was walking backward and talking to the others. “What is a snake’s favorite thing to study?” curly-haired Hades asked. “Um, animal science?” guessed one of the other Olympians, Athena, a girl with thoughtful gray eyes. “Nope! Hiss-tory. Get it? Hisssssss-tory?” Hades repeated, and then he started laughing. “Ha-ha,” replied Hephaestus in a flat voice. The boy walked with the help of a cane carved with skulls and topped with a skull-shaped knob. The fourth Olympian and the leader of the group, Zeus, frowned. “Hades, I don’t mind the jokes, but do they have to be all snake jokes?” the black haired, blue-eyed leader complained. Even though Hades and the others looked like mortal boys and girls, they were actually immortal, and their actions were courageous beyond their years. Their biggest mission was to stop their enemies—the giant King Cronus and the king’s band of minions, the half-giant Cronies—from taking over the world. Zeus rolled his eyes as his two friends continued to bicker over who had actually slain the green-haired Medusa. At least it’s better than the snake jokes, he thought. The four of them were heading back to a village that they had just left the day before. So much had happened in the last twenty-four hours. Twelve Olympians had started off on another quest given to them by Pythia. She was the Oracle of Delphi, and she could see the future—if not always clearly. (Sometimes her foggy spectacles made it so she couldn’t see well, which meant her instructions could be a little confusing!) Pythia had seen that Zeus and the other young Olympians, all of them gods with special powers, would one day overthrow evil King Cronus, who ruled the Terrible Titans. The twelve Olympians hadn’t always been together. Zeus had gone on his first quest with only two others, Poseidon and Hera. On each new quest they fought monsters and other mythical beasts. They found magical items. And they added new Olympians to their group. All twelve of them had traveled to the village yesterday. Pythia had told them to look for “hairy snakes.” Nobody had known exactly what that meant, so the twelve had split up into three groups to try to hunt down the hairy snakes. Now that Zeus’s group had succeeded, they were trying to meet back up with the other two groups. Zeus smiled. His brother Hades was also ruler of the Underworld. He liked creepy things. The village was bustling with people shopping at the market stalls. Hades shook the cloth pouch dangling from his belt, and it made a jingling sound. “Not if you want to hang out with us,” came a voice behind them. Zeus, Hades, Hephaestus, and Athena turned around. Four of their Olympian friends stood there: Hera, Hestia, Demeter, and Poseidon! The girl speaking was Hera, Zeus’s blond-haired, blue-eyed (and sometimes bossy) sister. Hades ran up to her and gave her a hug. “You guys are back!” he cried. “Yeah, well, there were no hairy snakes in the mountains,” Hera reported. “Just a lot of goats,” Poseidon added. “Did you find the hairy snakes?” asked Demeter. Hestia pointed to a meadow just beyond the village. “I’ll help you,” Athena offered. “And I’ll help Hades do the shopping, so we don’t end up eating a whole bunch of stinky cheese,” added Hera. It wasn’t long before the eight Olympians were gathered around a small fire, started by Hestia and her magic torch. They roasted sausages on sticks and ate chunks of cheese while Zeus, Hephaestus, Athena, and Hades told their story. They explained how a young thief, Perseus, had led them to Medusa, a monster with snakes for hair—Pythia’s “hairy snakes.” Athena had tricked Medusa and turned her into a statue. 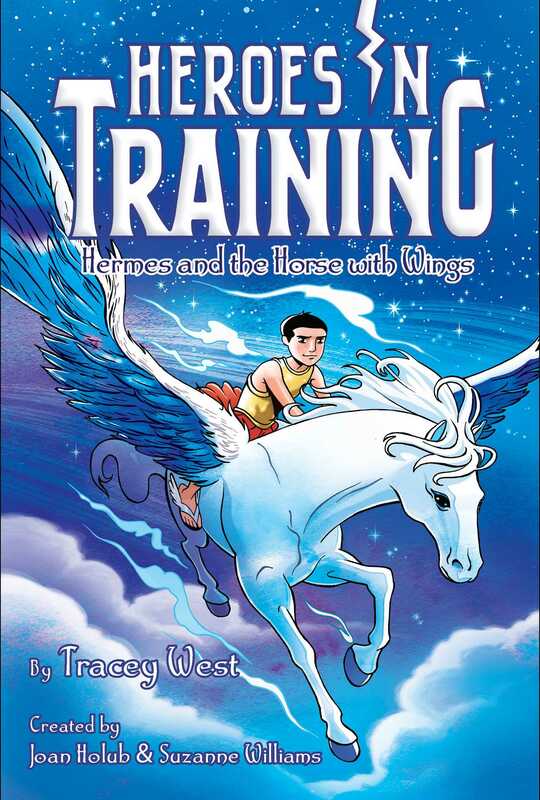 “So, after my cane destroyed the statue, this horse with wings came flying out of it,” Hephaestus said. “A winged horse? Cool!” said Poseidon. Bolt was one of Zeus’s magical objects. After Zeus had pulled Bolt from a stone at Delphi, he had used Bolt on all of their big quests. The lightning- shaped dagger could grow large or small at Zeus’s command. It had saved the Olympians from many monsters—and now it was gone. “And Pythia might have a new quest for us,” Athena reminded him. “She might be waiting until all twelve of us are together again,” Hera guessed. “We’ve got four and four, but we need four more,” Hades quipped. Zeus looked down at the smooth oval stone that he wore around his neck. Chip was his second magical object and helped guide the Olympians in the right direction. Right now a big red C was glowing on the stone. Suddenly the group heard a commotion in the distance. “Uh, yeah, Bro. . . . I think that C definitely stands for ‘Cronies,’ ” Hades said, staring past Zeus. His pale face was even paler than usual as he pointed a shaking finger toward the village. Zeus looked up from Chip. He could hear screaming. Out of nowhere, three hulking half-giants, soldiers of King Cronus, stomped through the market. Zeus reached for Bolt around his waist out of habit—but of course it wasn’t there. “Quick! Put out our fire!” he yelled.